One facet of the East End life not yet touched upon was the ubiquitous public house; like a church, a pub was always no more than a stone’s throw away, and more often than not, could be found on street corners. 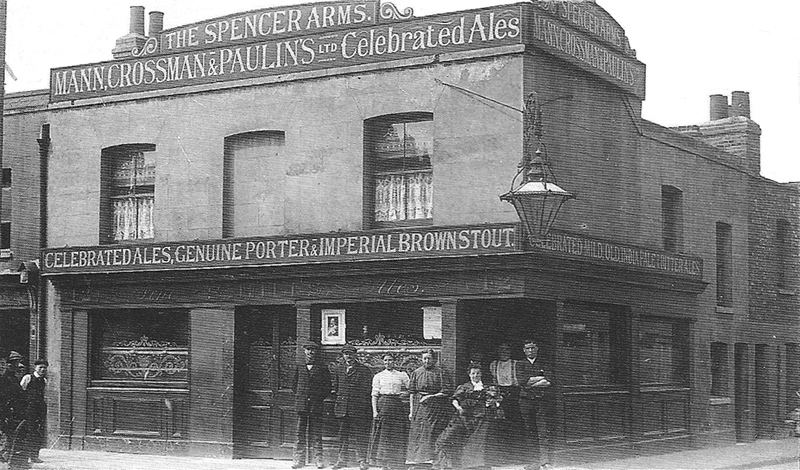 The Spencer Arms was located on the corner of Dean Street and Spencer Street, next door to Abraham Nerhard’s grocery shop (seen far left). In the early 1900s, Silas Hill was landlord of the establishment, and lived on the premises with his family. This photo dated c1910 is packed with detail, from the sign written boards, the peeling block walls, the net curtains in the upper story windows, and the wooden panelling on the ground floor. Etched glass was perfected in the 19th Century, and the Spencer Arms doesn’t disappoint with a fantastic display on the large window panes as well as the doors. As with many East End pubs, this one had a fabulous lamp over the door, no doubt to attract the punters out of the cold or another greasy pea-souper. Are you sure that the building is block-work? The peeling top right looks like water damage to either a painted surface or cement render. These buildings did not have the traditional guttering and downpipes, rather there is a gulley behind the facade and I suspect that the gutter is either leaking or blocked with debris leading to the cracked and spooled surface of the capping stone. As to the group spiiling out of the pub door, what is being held by the lady on the right? A child possibly… a small dog… maybe a monkey? This image, more than any other which you have used to date, reminded me of stories which Dad and his brothers would relate about their childhood days in the East End (let us just say somewhere near to Poplar and Homerton). The pub was a constant in the telling and Mother was forever going to the local to retrieve her man in time for Sunday Lunch. Now there is a scene which you ought to include.. my Paternal Grandfather owned a butcher’s shop somewhere in the area… no family photos though. It could well be be cement render over another material such as brick, though blocks were not unusual in the East End, and I agree about the water damage, whether to paint or render – or both. Whatever the case, the original photo shows what appears to be large blocks measuring approx 30″ x 18″ when using one of the men directly beneath as a reference point, and there also appears to be large keystones above the windows. Of course all this may well be render scribed to imitate blocks! The group are apparently the family of Silas Hill, and the lady appears to have a small child in her left arm (though I suppose it could be a monkey!) with a dog standing on hind legs on her right. I’ve heard many stories of wives heading to the pub to retrieve their husbands, and can imagine front doors clicking shut in time to a steady footfall as a growing swarm of women descended on pubs en masse at five-to-one, with steely eyes and set jaws, drying calloused hands in their pinafores, and every one looking older than their years.